Is the iPad Apple's greatest folly? There have been several factors that have kept Apple (and its fan base) alive, not least of which is the design of its products. Apple is synonymous with cool gadgets, and this is due in no small part to one Jonathon Ive, who has been responsible for the design of the iMac, iPod and iPhone to name but a few. He's also the man behind the svelte styling of the latest addition to the Apple stables, the unfortunately-named iPad. This isn't too surprising given that the iPad is essentially a super-sized rendition of the iPhone, with a smattering of bells and whistles to make it more relevant to its target audience. Apple clearly has high hopes for the iPad, with the $499 price tag for the entry level model, although how this translates into UK pricing will be interesting as ever. While we can predict that there are certain groups that will lap up this new machine, we can't help feeling that there isn't much of a market for this 'third category' device. Is there really a need for a device such as this when so many of us already have access to notebooks, netbooks and smartphones? Here are PCFormat magazine's thoughts on what the iPad means for the industry as a whole, and what it means for PCs specifically. A surprisingly tricky question to start the dissection of Apple's new device is: who and what is it for? Steve Jobs believes the iPad fills the gap between the capabilities of a smartphone (and lets pretend he's opening that up to non-iPhones) and the versatility of a laptop (again, lets assume that includes non-Macs). After dismissing the current generation of netbooks, he espouses the view that any device attempting to fit into this category needs to perform better than laptops and smartphones in order to succeed. It's always helpful when the company behind a new technology outlines the criteria for its failure. So if the iPad isn't better at the following, according to the head of Apple himself, he will deem it a failure: web browsing, email, photo viewing, video and music playback, gaming and eBook reading. Most laptops are capable of achieving all of those things perfectly well already, so it's a tall order. Maybe it's already failed. Let's be kind, though, and suggest that the iPad needs to offer a better user experience for performing such tasks. And that includes gaming, which should be interesting. Is the iPad even a computer in the traditional sense? It resembles a large iPhone, uses the iPhone OS and according to a recent survey by YouGov, a surprising 37 per cent of people that are aware of the device believe you can make calls from it. You can't by the way – that would be silly. It's not really like an iPhone at all then… more like a huge iPod Touch. Such surveys also do a good job undermining arguments that it's not for computer savvy people. There's clearly a lot of confusion about what it is, and that's after the biggest slice of hype pie to hit the interwebs so far this year. Is it really for mums, dads and grandparents of this world? A funky device to have in the room when you simply want to access the internet while watching television? Is it for people that don't want the hassle of opening a laptop to access the same information? Because, obviously, laptops are well beyond the abilities of most people. What is in little doubt is that the user interface is going to be exemplary. The iPhone may not be everyone's dream smartphone, but you only have to slide your fingers across its screen to see that Apple knows a thing or two about interface design. There are new challenges that come with the larger display, though; several people trying to interact with the iPad at the same time isn't too unreasonable a notion given its home-focused market. Peer closely at the hardware of this new machine and you'll discover some interesting choices and a few surprises. The processor, for instance, isn't an off-the-shelf, Intel unit as found in its latest Macs, or a RISC ARM chip either (as found in the iPhone). Instead, Apple has developed its own processor for the task. Dubbed the A4, this is a System on a Chip (SoC) boasting integrated graphics and a parsimonious power draw. It's intriguing that Apple has decided to develop it's own chip, especially given the number of alternatives out there. Should Intel be worried about its lucrative Mac market? Probably not, as the iPad is a completely different beast to the Mac, but you never know. 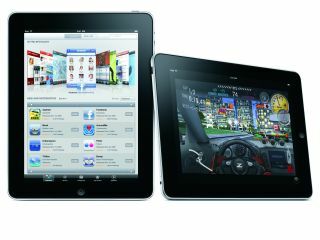 The other crucial point with the iPad is that Apple has built the iPad around an in-plane switching or IPS screen, something it should be applauded for, as the technology offers vibrant colours and great viewing angles. Don't clap for too long, though; there's an obvious downside, and that's the resolution. At 1,024 x 768 this simply doesn't pack enough pixels for a media device in this video-heavy day and age. High-definition movies for instance are going to struggle on such a display, as the horizontal resolution requirement of 1,280 pixels just isn't available, no matter how many times you twist the thing around in your hands. And do you really want to hold this in your hands while watching a film? The initial reaction to the screen seems to have focused on the inch-thick bezel. It's bigger than anyone would like, it's true, but to be fair to Apple, you have to hold the iPad somewhere, and chances are that having the whole surface as a touchscreen caused all kinds of accidental navigation problems. It does highlight the space around the screen that could accommodate a camera though – apparently there's even a space for a camera in the chassis, but Apple has deigned not to have a camera there. Again though, would you really want to hold this out in front of you for long periods of time, when making a video call, or should we all get used to staring at each other's ceilings? Another point that has riled many from the moment the specification details were announced is the lack of a USB port on the iPad. It isn't like people want to copy files though, that would be entirely silly. Connecting cameras? Such Foolishness. In fact the Universal bit of USB is clearly over-hyped anyway, so why would anyone want to plug a device into their shiny new iPad? Besides Apple needs to make a bit of cash by selling adaptors for all those cameras that you may just want to plug into it. Since we're complaining about what it can't do, there are some notable oddities. It can't multitask. This isn't a major problem when you're talking about a phone operating system, but surely being able to chat to a friend while viewing a web page at the same time isn't too unreasonable. And attempting to type anything other than a short text length message, using an onscreen keyboard is surely for masochists only?